A special fan extracts the dust and skins and blows them into the cyclone. 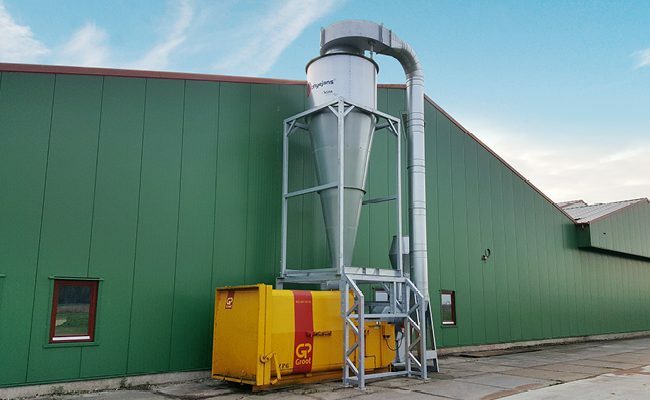 The cyclone is an ideal system for separating dust and skins from the air. The waste is discharged from the bottom of the cyclone and falls into the waste container. If a cellular wheel sluice is also installed below the cyclone, the waste can also be discharged onto a conveyor belt. The filtered air, which is 95% clean, is discharged overhead through the flue. The cyclone is made from Sendzimir galvanised sheet steel and will last for many years. The cyclone frame is hot-dip galvanised. The cyclones are available in several types with different extraction capacities. 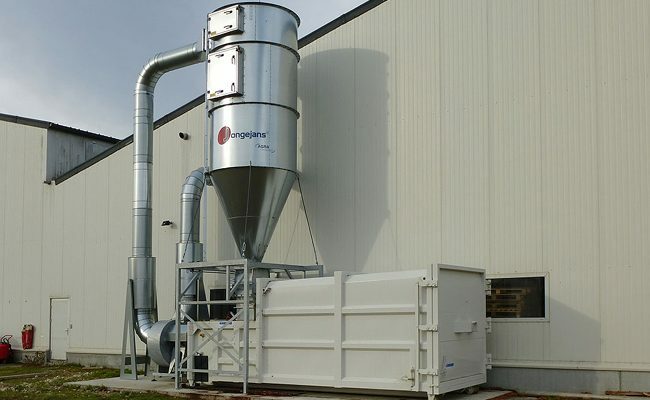 The cyclo-jet is a filter system that separates extracted agricultural dust and skins from the air. 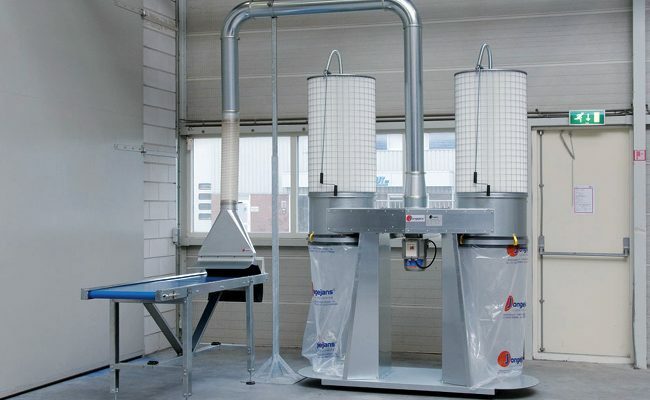 The integrated cartridge filters, which are cleaned by compressed air, completely clean the extracted air before feeding it back into the processing room. This prevents heat from being lost and saves energy. Dust and skins are discharged from the bottom of the cyclo-jet and fall into a waste container, or are discharged onto a conveyor belt. 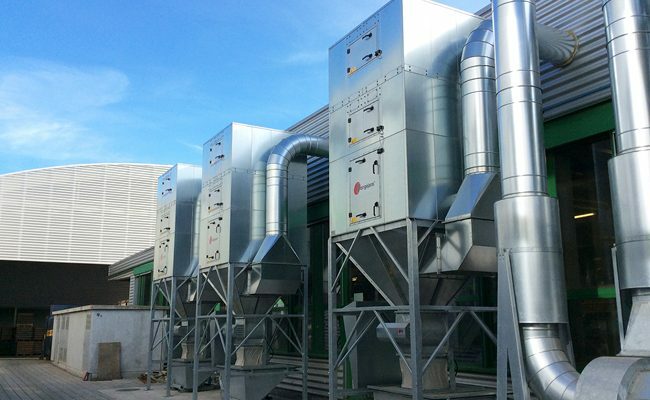 The entire system is made from galvanised material to ensure a it lasts for years. The filters are cleaned automatically. This guarantees optimum extraction capacity at all times. The PGF is a filter system used to extract agricultural dust. The unit consists of several extremely quiet, high-efficiency extraction fans and filters that are automatically cleaned with compressed air. This ensures the PGF maintains its suction force. The clean, filtered air is fed back into the room. This means the heat is retained in the room. If required, the dust can be collected in small rolling containers or in a large tilting container. The PGF series is available with several extraction capacities to provide the perfect solution for any set-up. 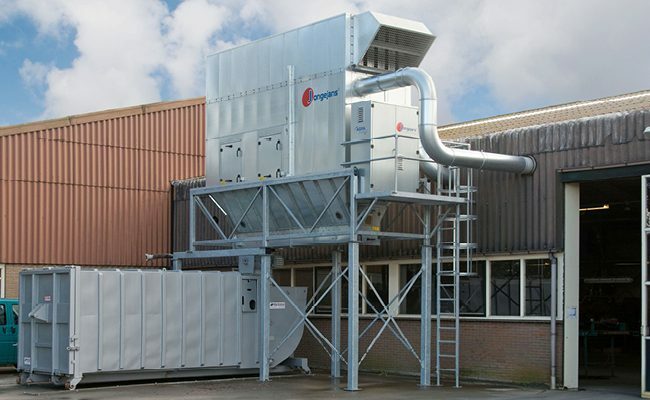 The PGKF filter system was developed for large agricultural companies. It extracts dust and skins. This unit consists of several extremely quiet extraction fans and compressed air filters that are cleaned automatically using compressed air. This ensures optimum suction force is maintained. The capacity can be adjusted variably and is automatically configured to suit your requirements. A special chain is located in the lower section of this system. The chain ensures that the extracted waste is taken to one point where it is deposited into a waste container or a compactor. The filtered air is clean and can be fed back into the room. This prevents heat from being lost and saves energy. Several models of the PGKF chain filter are available.